Craig Sanchez, brother of Jeanine Sanchez Harms, hangs signs before the start of a fundraising event that took place Aug. 16 at the Los Gatos Lodge. 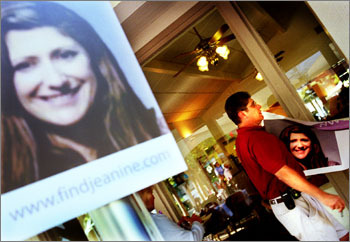 Harms has not been seen since July 27 when she was at the Rock Bottom Brewery in Campbell. The Los Gatos Lions Club sponsored the event, which was attended by more than 100 people, including Los Gatos-Monte Sereno Police Chief Larry Todd. Harms' aunt, Lucy Sanchez-Crumpton, is a member of the Los Gatos Lions Club. She will represent the family as efforts to find Harms continue. Sanchez-Crumpton will take over these duties from Craig Sanchez, who is going back to his home in Maryland.